Hey Everyone! 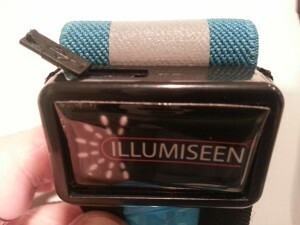 Today I’m going to talk about a reflective belt called Illumiseen. A few weeks ago a company rep sent me a belt so I can test & write a review. 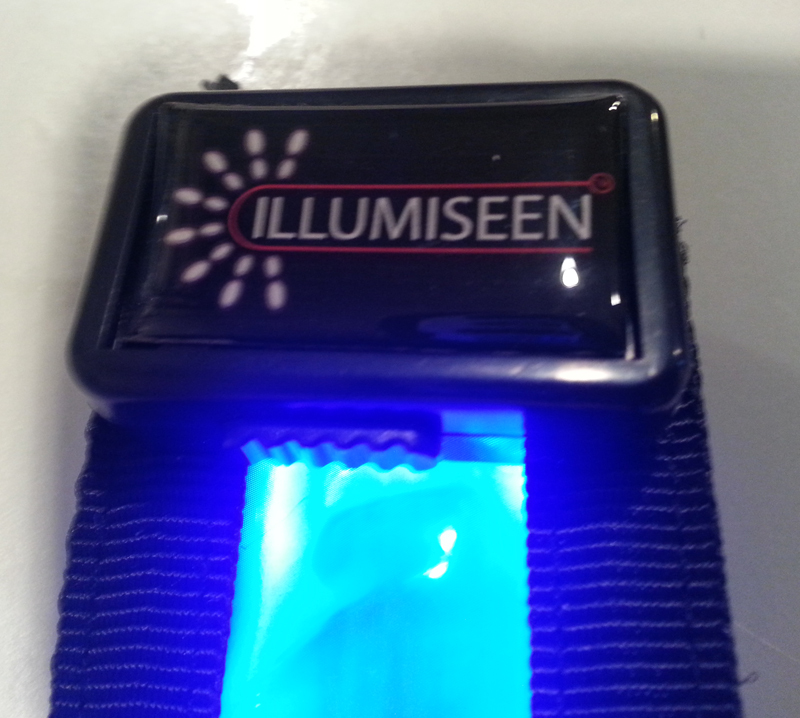 The Illumiseen is a LED reflective belt. 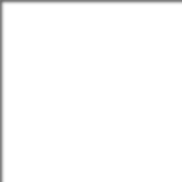 The company offers three different color belts. Green, blue or orange. I chose blue. It is 1.5” wide. The blue light/ reflective light area runs approx 17” of the length of the belt. The light has a strong black material sewn along the edge that wraps around to the back of the light. The rest of the belt is a stretchy material which is also reflective. The belt closes with a hard plastic buckle. Note: On Amazon — a customer rep replied to a question about size of belt. These numbers are different than what I just measured. Possible I have a different version belt? “The total size (LED part included) of the belt can be adjusted to Min. 31.5 inches and Max. 48.4 inches. Because the belt straps are elastic, the maximum size is actually a little bit more (53 inches). The belt gets its power via a USB cord. (included). There’s a small plastic box attached to the belt with a power button & a usb port. It has two modes. The power button slides over to the right. On the first click it will make the LED light flash. The second click keeps the light on solid. Slide it all the way back to the left to shut off. When I received the belt It had a charge. I plugged in the usb cord & connected to my laptop. Initially a red light came on. In about 30 mins the light turned green – indicating the LED light was fully charged. I have not been able to drain the light down enough to report on how long the light lasts. However, on Amazon another reviewer commented — 36 Hours of Illumination per 2-Hour Charge. So far I have used the belt for night time dog walking. I have it rolled up which makes it easy to throw in a day pack/ small backpack or keep handy in the car. Its small & light enough – plus it has so many uses I like keeping it handy. Its bright! Besides great visibility outside while walking on the road — I did a test by closing myself in a dark closet. It lit up a small area pretty good. So for those taking the Illumiseen camping or hiking it can be a dual purpose item. It will give enough light in a tent or hammock or even around camp. The Illumiseen belt works as advertised. Not only for dog walking but it can be used as high visibility safety gear for running, walking, biking – Ideal for Motorcycles, Police & Military. Below is the descriptions from the manufacturers site. Designed to keep you safe and visible from all angles, this illuminating belt is your safety tool of choice. Whether it is running, walking, hiking, riding your bike, motorcycling or horseback riding: The Illumiseen belt is the perfect companion for all of your outdoor activities. Thanks to the 3M Scotchlite™ reflective material and custom-designed fiber optics it reflects oncoming light AND gives off a powerful beacon in the dark. That’s why it’s safer than regular reflective belts or vests because unlike these, the Illumiseen belt doesn’t need an external light source – it works all the time thanks to its powerful LED technology. The weight of the Illumiseen belt is only 139 grams, yet it’s sturdy, well-constructed and built with durable materials. 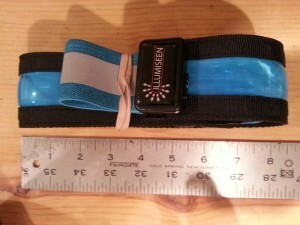 The belt is fully adjustable and designed to fit both adults and children. It’s USB-rechargeable so you never have to buy new batteries again. And last but not least: each belt comes with a 100% better than money back guarantee!